The Low-Down: Amazon Acquired Whole Foods 1 Year Ago. How Much Has Changed? Amazon Acquired Whole Foods 1 Year Ago. How Much Has Changed? Whatever Amazon’s grand vision is for Whole Foods and digital grocery, it seems largely unrealized. Amazon investors appear content to give the company time to keep tinkering. Online grocery has only just reached its tipping point for widespread adoption. There are going to be millions more dollars up for grabs in this channel in the next several years, and habits aren’t yet ingrained for who gets them. Old-school retailers came a long way this year toward positioning themselves to get a piece of the action. One year ago this week, Amazon.com Inc. loudly declared its intention to become a grocery industry heavyweight by announcing its agreement to buy Whole Foods Market. The $13.7 billion deal practically guaranteed sweeping change in a segment of the retail world that hadn't yet felt the sting of e-commerce. By marrying Amazon's digital prowess and appetite for price-cutting with Whole Foods' well-established perishables supply chain and network of stores, it seemed a trip to Whole Foods or a tap of the Amazon app was about to become ground zero of food-shopping innovation — and a top choice for customers. 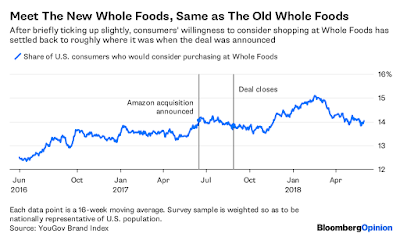 Flash forward to today, and if you’re looking for clear evidence of how this deal has transformed the industry, you won’t find much at Amazon or Whole Foods, though Amazon remains a formidable force in online groceries. Rather, it’s in the flurry of counter-actions taken by their spooked rivals. 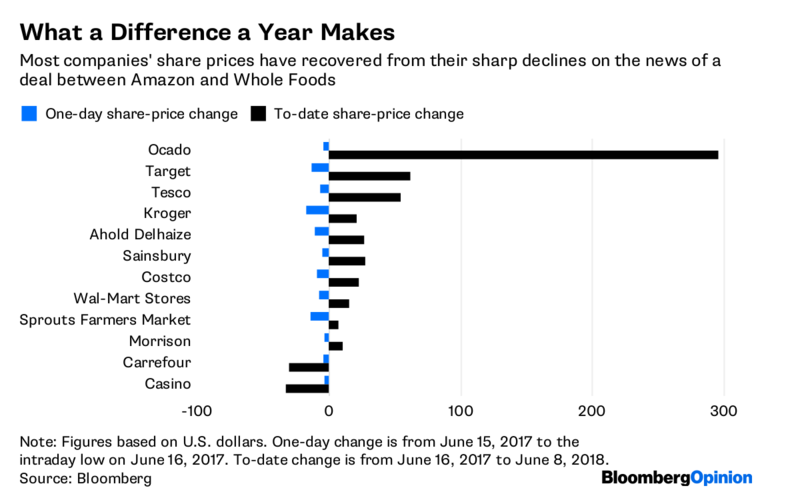 Whole Foods is basically still the same chain it was when Amazon bought it. Sure, there have been price cuts on some key products and an additional discount on sale items for Prime members. But the kiosks displaying Amazon gadgets and deals on Mother's Day tulips? Those things are more cosmetic. Whatever Amazon’s grand vision is for Whole Foods and digital grocery, it seems, for now, largely unrealized — or at least unseen from the outside. And Amazon investors appear to be content to give the company time to keep plotting and tinkering. No so the old guard of the grocery world. It doesn’t have that luxury, which was made plainly obvious when investors sent their shares tumbling after the deal was announced. Industry leaders Walmart Inc. and Kroger Co. seem to have gotten the message and are dramatically increasing the reach of their online grocery offerings. While nothing can completely inoculate them from the threat, they are now better equipped to compete and might even gain early-mover advantage in markets that Amazon and Whole Foods haven't blanketed yet. Walmart, with help from partners such as Doordash, says its grocery delivery program will cover more than 40 percent of U.S. households by year-end. It is also set to nearly double the number of stores that offer online grocery pickup services. Kroger, meanwhile, now offers its ClickList pickup program from more than 1,000 stores and is expanding its delivery partnership with Instacart. It also agreed to take a stake in British online grocer Ocado Group Plc, and is working with that company to identify sites for automated warehouse facilities that make use of its technology. 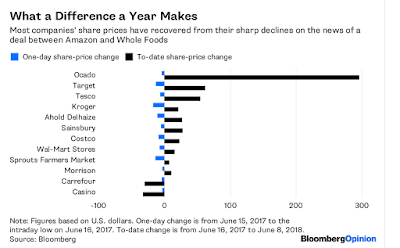 The grocery business has also dabbled in some M&A of its own that would seem to be a pretty direct defense against the Amazon-Whole Foods threat. Target Corp.’s $550-million acquisition of grocery-delivery startup Shipt fits the bill, as does Albertsons Cos.’ agreement to acquire Rite Aid Corp. And there are other ways that legacy grocers are trying to give digital-first dining ideas a home in their brick-and-mortar stores. Costco Wholesale Corp. is now selling Blue Apron meal kits, while hundreds of Giant and Stop & Shop stores have just begun selling meal kits from HelloFresh SE. Investors should be heartened by this burst of activity from supermarkets and big-box stores even if, on one level, you could argue it hasn’t made much of a difference yet. As mentioned, many grocers saw their market value get whacked last June when this deal was announced. Several of them weren’t quick to recover — and some have a lower market capitalization now than before the deal. And none of them are truly outgunning Amazon in the digital realm. More people have bought groceries online from Amazon recently than from any of its competitors, according to a survey conducted in March by Coresight Research.But here's the thing: Online grocery has only just reached its tipping point for widespread adoption. There are going to be millions more dollars up for grabs in this channel in the next several years, and habits aren’t yet ingrained for who gets them. Old-school retailers came a long way this year toward positioning themselves to get a piece of the action. And while those players were hustling to get better at what Amazon does best, Amazon appears to be taking its time learning how to do what the traditional stores do best. 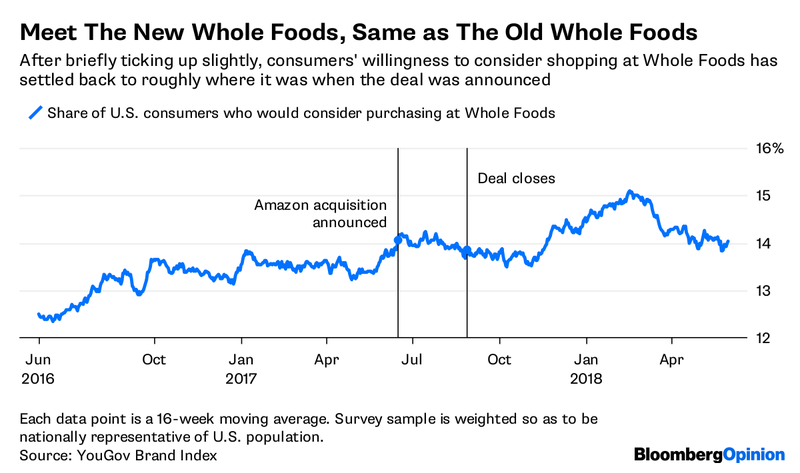 Maybe that's why there hasn't been a dramatic change in consumers’ willingness to consider shopping at Whole Foods.I suspect Jeff Bezos has plenty of big ideas for Whole Foods. But each day that passes with minimal change at the chain is an opportunity for the legacy brick-and-mortar chains to shore up their defenses. And they appear to be taking advantage.